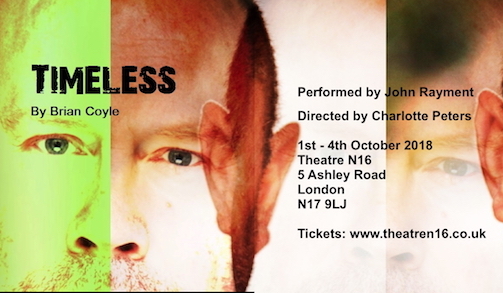 John Rayment performs the solo play Timeless, written by Brian Coyle, directed by Charlie Peters, at Theatre N16, 1-4th October, following its success at the Camden Fringe in August. Timeless tells the story of Martin, a London cabbie. Since he went to the dentist ten years ago, he can’t make new memories. Every morning when he wakes up it’s 2008. The last ten years? A total blank. He has The Knowledge, but he doesn’t know what he had for breakfast.